The first version of this scripting language was introduced in the CFF Explorer VII. The initial idea was a very simple one: offering a basic command line support to modify resources in a Portable Executable, just like Resource Hacker. The command line / script support was requested by a community of people who needed it for their software to change some Windows resources. After bouncing a little bit the idea in my head it evolved into a bigger project: providing a scripting language to do most PE tasks. The first two possibilities I came up with were Python and Lua. Initially, I thought Python would've been a little too much for a PE editor; it seemed to me that it would've been like opening a door with a panzer. However, I might have been wrong. In fact, a lot of tools like IDA are opening up to Python and my choice might have been a misjudgement. Anyway, the Lua language is not very different in its syntax from Python. So, at least, it'll be easy for Python programmers to use it. For this is the first version of this scripting language, I have no idea if people will like it. Even if it'll turn to be useless, I think it's an interesting feature, and, even though time consuming and sometimes not so easy, it was fun adding it to the CFF Explorer. Lua is a very easy language to learn. This paragraph is absolutely not an extensive guide about Lua, rather a brief description of its main features. If you want to learn more about the language, you can visit Lua's documentation page. Keep in mind that there are a few differences between the standard Lua and the one I implemented in the CFF Explorer, so check out the paragraph about the differences. I think the reader will eventually be surprised by Lua, which, despite of being a small language, is very powerful. It takes quite a bit of time to discover all its features and possibilities. This paragraph should give developers a basic idea of how to write simple scripts in Lua, but for more advanced topics consult the online documentation or one of the several books (yes there are quite a few) written about the Lua language. First of all, this language is case sensitive. Thus, you can't call the function "msgbox", when, in fact, it ought to be written "MsgBox". The version of Lua implemented in the CFF Explorer supports 64bit numbers. This factor was very important regarding the language choice. A language without 64bit number support would've been unfit for the tasks it's supposed to accomplish. This is called dynamic typing. One thing I like about Lua is that it doesn't rely on indentation like Python: all code blocks are terminated by the word "end". Tables are made of the data itself and the key to access this data. In the example above no key is specified. Thus, a default keys is assigned to all members: a number. To access one of the members of the table above just write var[n]. In Lua tables are 1-based, although in the CFF Explorer implementation of Lua this isn't the case. This is one of the things listed in the next paragraph explaining the differences about standard Lua and the one implemented in the CFF Explorer. This will print the number of rows in the table var. I think the only block which needs a bit of explanation is the for loop. The syntax of the for statement is: for exp1, exp2, exp3 do. Every value of exp1 must reach exp2 using exp3 as the step to increment exp1. exp3 is optional, if no step is specified, the default step value is 1. It's just a coding style issue. In the above example you've seen making use of the key word "local". You can use "local" to declare variables which are going to be valid only the scope of the current function / block. The variable var does not exist outside this do-block. By the way, do-blocks can be used as in the example above to have a better overview of local variables. -- prints "1 and 2"
After reading this short paragraph, I believe, every developer has entered the Lua logic and is able to write some simple scripts. As mentioned in the previous paragraph, the Lua implemented in the CFF Explorer doesn't respect the standard implementation. I modified / added quite a few things. Most of the changes were, in my opinion, necessary in order to make the language easier for C/C++ developers and for the task it is supposed to fulfil. I'm going to summarize the main differences between the standard and this implementation of Lua in very brief chapters. Notice that the ^ operator in standard Lua stands for power and is followed by the exponent. Since I introduced C/C++ bit operators, I thought it was more important to have a normal xor, than to preverve Lua's standard power operator. If you want to use the power operator, write ^^ instead of ^. Its first element is array. 0-based tables are one of the reasons (not the only one) I didn't enable most of the standard Lua functions (although some basic functions are available), since most functions exported by these libraries don't work correctly with 0-based tables. I think 1-based tables are Lua's biggest flaw. A lot of people are complaining about them, but changing the inner behavior of Lua to let it treat 0 just as any other index is not so easy. This was really the most difficult choice I had to face when implementing Lua: leave 1-based tables or convert them? Making them 0-based brought a performance and a compatiblity loss that I accepted (not without doubts, though), since most developers would've gone made the other way (having also in mind the kind of developers who would use this scripting language). Again, I think I made the right call. I think this is quite useful and comes handy if one wants to execute a script function from command-line. All Portable Executable related definitions in WinNT.h are provided. Most definitions of CorHdr.h are provided. Some Win32 definitions connected with the Win32 APIs wrapped by the scripting language are provided. The available definitions are thousands. One other thing you'll frequently see in CFF Explorer scripts is the use of the type "null" instead of Lua's standard "nil". Lua's "nil" is still available, I added "null" because "nil" reminded me too much of Pascal/Delphi. It's simply a style choice. Drag it with the mouse on the GUI. Load it from Open File or from the dedicated menu. Specify the script path command-line argument. E.g. : CFF Explorer.exe myscript.cff. CFF Explorer's scripts have the extension "*.cff". You can write a script in any of these encodings: ascii, unicode, UTF-8. The CFF Explorer recognizes the encoding with the same procedure used by the Windows Notepad. Unicode and UTF-8 files have a two-byte signature at the beginning (you can't see it directly in the editor). Once the CFF Explorer has determined the encoding, it'll handle it the right way. Lua doesn't natively support unicode strings. Thus, you have to understand that at runtime, the script will be working with UTF-8 strings. To sum up, the point is that you can use chinese or russian characters, as long as you save the script as unicode or UTF-8 text file (just like the notepad does). All handles opened by a script are automatically closed after its execution. Nonetheless, closing handles during the execution is just a better coding style and is very advisable if the script opens many handles (which might be memory consuming). To close a handle (of any kind) use CloseHandle. It means that you can either pass a string (containing the file name) or a handle (of a previously opened file). If the functions modifies the file and you called the function through file name, then it'll apply the changes directly on the file. Viceversa, if you called the function through file handle, changes will be applied in memory only and to save them to disk, you'll have to call either SaveFile or SaveFileAs. Using handles is advised when doing more than just one operation on a file or when you want to save the file with a different name. The CFF Explorer scripting language offers many APIs to easily manipulate Portable Executables. In addition to that, it offers functions to walk through the file system, functions to execute external application, to delete files etc. Thus, running a script could potentially be dangerous just like running an executable and could, in theory, behave just like a virus. To avoid problems for the user, I implemented some sort of UAC (don't worry it's not annoying like the real one), which I called Scripting Privilege Protection (SPP). Certain functions in order to be performed ask the user for consent. Once the user has given his consent, the script will be high-privileged and can execute any function. If the users doesn't give his consent, the function fails. A script might check if it's high-privileged through the function HasHighPrivileges. Moreover, a script can explicitly ask the user to give high privileges to it through the function RequestHighPrivileges. You can know if a function needs high privileges or not by looking it up in the Functions Reference. This paragraph goes down to the practice. What follows are just a few examples of what the CFF Explorer scripting language is able to do. Listing every possible application would be impossible for me, there are just too many. I start with this paragraph, because if people will use the CFF Explorer scripting feature, most of them will do it to edit PE resources, I guess. Scripting functions to handle resources have a few advantages over Win32 APIs. In fact, Windows APIs do not handle special resources in a specif way. Adding a bitmap (or another special resource) to the resources rawly won't work: special resources are to be handled in a specific way before storing them in the Resource Directory of a PE. And that's what the CFF Explorer scripting APIs do. Also, Windows APIs for resource handling require the language coordinates for the resource. If the language is not the same as the one of the resource in the file, Windows APIs fails. These APIs, viceversa, can (as this is optional) be used without language coordinates. This comes handy if, for instance, one needs to delete a resource in a PE, but doens't know the resource's language. In that case the DeleteResource API deletes the first resource with the given name / id. In the code example which follows a manifest resource is transferred from one file to another. The CFF Scripting language can be used to accomplish easy PE editing task such as the one which follows. This very little script patches x86 executables in order to let them have 4GB (instead of only 2) of virtual memory on x64 platforms by setting a flag in the File Header structure. I guess this needs no further explanation. Even advanced PE editing can be easily accomplished using the CFF Explorer scripting language. In the next sample, we'll see how to add code to the last section of a PE, redirect the entry point to our code, jump from our code to the original entry point and, finally, update the PE's checksum value and remove the strong name signature in case it's a .NET assembly. I don't want to encourage someone to infect a PE through scripting. I just want to show how easily a more advaced task like this is performed with very little of code. Also, the logging functions will be used in this script, so we will be informed about every step of our code. logname = GetCurrentDirectory() .. @"\peadv.txt"
I don't want to imply that the CFF Explorer scripting is almighty, but, as you can see, what I did through this script would take a little bit more in C++. Also, what I did here might not be very useful, I just wanted to show the scripting's potential. I wrote this script in 20 minutes, not more. 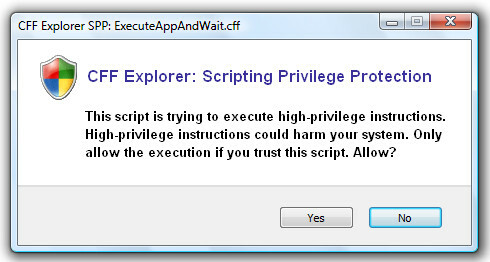 This is one of the most "on the fly" applications for the CFF Explorer scripting. The function SearchBytes searches for an array of bytes where wildcards are allowed. This is perfect for code patches. As you can see, we wrote a generic patch in about 10 lines of code. I think this is quite a comfort for most experts who need to write a patch on the fly. To retrieve a Lua array from a given file use the CFF Explorer: open the Hex Editor and then click on Copy Lua Array. To patch you can either use the Data Access functios or the Assembler functions. Reports of PE information can be easily generated through scripting. In the example which follows I'll show how to create a report of a PE Import Directory. Import Directory report for "C:\...\CFF Explorer.exe"
This is even a complicated report, but the code is quite easy as you can see. Of course, not all reports have to be this complicated. One last code sample is about extension setups. CFF Explorer extensions can now be installed in an elegant way through scripting. This is way better than manually placing the files in the CFF Explorer extensions directory. Not only that, but the scripting language is able to install the right files for the current platform by using the function GetCFFExplorerMachine, which returns the machine of the CFF Explorer executable. -- © 2007 Daniel Pistelli. All rights reserved. SetupDir = GetCurrentDirectory() .. @"\Resource Tweaker\"
ExtDir = CFFDir .. @"\Extensions\CFF Explorer\Resource Tweaker\"
This is quite easy and doesn't need any coment. Retruns true if the script has high privileges, otherwise false. Ask consent to the user for high privileges. Retruns true if successful, otherwise false. Returns the directory of the CFF Explorer. E.g. "C:\...\Explorer Suite". Returns the value of FileHeader->Machine, which for the CFF Explorer can either be IMAGE_FILE_MACHINE_I386, IMAGE_FILE_MACHINE_AMD64 or IMAGE_FILE_MACHINE_IA64. Returns the current directory. E.g. "C:\...\Files". If the script was processed through command line, the function returns null. Doesn't have a return value. Remarks: this function needs high privileges to be performed. Closes a handle previously opened. Can be any kind of handle. Returns the size of a given file. If the function fails, it returns null. Returns a handle to the opened file. If the function fails, it returns null. Remarks: the opened file is loaded into memory. This is not a standard OpenFile, but the function providing a handle for all other scripting functions to operate with. Saves a file to disk. If only the the file handle is provided, it saves the file with the current name. Otherwise it acts like SaveFileAs. Saves a file to disk with a given name. Creates a new log file. If the log file already exists and the bAppend parameter is true, then all messages printed to the log will be added the existing ones. Returns a handle to the created log. If the function fails, it returns null. Prints a string to an already opened log file. If the AssemblyType parameter is not specified, the function tries to automatically recognize the file type. The DISASM_NET value stands for .NET assembly. Remarks: if the jump/branch is already conditional, the function fails. Reads a byte from a given file at a given offset. Returns the data if successful, otherwise null. Reads a word from a given file at a given offset. Reads a dword from a given file at a given offset. Reads a qword from a given file at a given offset. Reads an array of bytes from a given file at a given offset. Reads a string from a given file at a given offset. bUnicode tells the function if the string to read is encoded as unicode. The default value for this parameter is false. If the parameter Lenght is not specified, the function looks for a null terminator to calculate the string's lenght. Returns the string if successful, otherwise null. Writes a byte to a given file at a given offset. Writes a word to a given file at a given offset. Writes a dword to a given file at a given offset. Writes a qword to a given file at a given offset. Writes an array of bytes to a given file at a given offset. If you don't specify the size, the function writes the whole array. Writes a string to a given file at a given offset. bUnicode tells the function if the string to read is encoded as unicode. The default value for this parameter is false. bTerminator specifies if the string's null terminator should be written or not. The defualt value for this parameter is true. Fills a specified amount of bytes in a file with a given byte-value. Basically the same as memset. Searches a byte array in a given file from a given offset. Wildcards in the byte array are possible through the use of the ND symbol. Returns the offset if successful, otherwise null. Returns the PE field offset. If the functions fails, it returns null. Returns true if it's a .NET assembly, otherwise false. Returns true if it's a 64bit PE, otherwise false. Checks if a relative virtual address is valid in the context of the specified file. Converts a file offset to a relative virtual address. Returns a relative virtual address. The function returns null if it can't convert to Rva. Converts a relative virtual address to a file offset. Returns a file offset. If the Rva is invalid, the function returns null. Converts a relative virtual address to a PE section index. Returns a section index. If unsuccessful, it returns null. Converts a virtual address to a file offset. Returns a file offset. If the virtual address is not valid, the function returns null. Converts a virtual address to a relative virtual address. Returns a relative virtual address if successful, otherwise null. Adds a resource to a file. Some type of resources are treated in a specific way to be correctly stored into the PE file. If you don't want the resource to be treated in any way, use AddResourceRaw, which puts the raw data of the resource into the PE file regardeless of special resource types. Remarks: if the given resource already exists in the PE, it will be replaced. Adds the raw data of a resource into a PE file. Deletes a resource of a PE file. If the language is not specified, the function deletes the first resource with the given name / id. Remarks: the Windows API to do this task requests the language as parameter. If the language is not the same as the one of the resource in the file, the Windows API fails. Thus, this function can be very handy if one is unsure about the resource language. Imports the Resource Directory from one PE to another. If bDeleteOld parameter is true, the function deletes the old resources. Used for resource functions. Creates a language id, just like in Win32. Saves a resource in a PE file to disk. Some type of resources are treated in a specific way to be correctly saved to disk. If you don't want the resource to be treated in any way, use SaveResourceRaw, which saves the raw data of the resource to disk regardeless of special resource types. Saves the raw data of a resource to disk regardeless of special resource types. Adds data to the last section of a PE. Returns the offset of the added data, otherwise null. Adds a new section to a PE. The Characteristics are the same as in Win32. Remarks: the section name cannot contain more than 8 chars. All other characters will be discarded. Adds a new section header to a PE. Adds a new section containing data to a PE. The Characteristics are the same as in Win32. The size of the section will be calculated based on the size of the data to add. Deletes a PE section. This functions deletes the section header and the section's physical space. Thus, it may reduce the file size. If you want to delete the section header only, use DeleteSectionHeader. Deletes a PE section header. Dumps the data of a PE section to disk. Gets the number of sections of a PE. Returns the number of sections. If the function fails, it returns null. Repairs a PE after it was dumped from memory. Binds the Import Table of a PE. Realigns a PE to a given value. Rebuilds the SizeOfImage field of a PE. Rebuilds the header of a PE. Removes a Data Directory from a PE. To remove the Debug Directory, use RemoveDebugDirectory. Strips all the debug information contained in a PE. Removes the reloc section of a PE. Removes the Strong Name Signature, if present, of a .NET assembly. Sets the new ImageBase of a PE. If the PE doesn't have a Relocation Directory, the functions fails. Updates the CheckSum field of a PE. Asks the user to choose a directory. Flags are the same as for Win32 Shell API. Returns the name of the selected directory. If no directory was selected, the function returns null. Asks the user to choose a file to open. The flags are the same as for the Win32 GetOpenFileName. To separate items in the Filter, use \n istead of \0. Returns the name of the selected file/s. If no file was selected, the function returns null. Asks the user to choose a file to open. The flags are the same as for the Win32 GetSaveFileName. To separate items in the Filter, use \n istead of \0. Asks the user to type something. A similar dialog is very useful and is basically the same as in VBS. Returns the input string. If there is no input string, returns null. Shows a message box. This function behaves exactly like the Win32 API. Returns the clicked button of the message box. Initializes a search process. The handle returned by this function can be closed with CloseHandle. However, the handle is automatically closed when FindFile has iterated through all the files and returns null. Returns a handle to use with FindFile. If the function fails, it returns null. Used to iterate a search process. For an example of how to search a file, see InitFindFile. Returns the name of a file. If there are no more files, the function returns null. Starts an external application and returns. If you want to wait for the started application to terminate, use ExecuteAppAndWait instead. Starts an external application and waits for the application to terminate before returning. Returns the long path name if successful, otherwise null. Returns the short path name if successful, otherwise null. As I already said in this article, I can't predict if this scripting language will be of any interest for the users, but it was fun implementing it and it really makes the CFF Explorer stand apart from other editors, in my opinion. And maybe someone will find it useful after all. I would have liked to implement many more functions and additions to the Lua syntax, but fact is that I've worked on this feature long enough for its first version: I really felt it was release-ready.